Tips for demonstrating the impact of words in ways that improve your students’ literacy and your relationships with them. The longer I teach, the more I realize that my rapport with each student is based on how effectively I speak with them, both publicly and one on one. When I express empathy, my students’ thoughts, feelings, and experiences are validated. Through my words of warmth and acceptance, each child becomes an integral part of our class community. I value the casual conversations and academic discussions we share. No matter how some students may hide it, all kids long to be heard and understood. Yet no teacher can hear a student if the class is a cacophony. Children won’t open up and share if they don’t trust that their teacher and classmates are truly on their side. Kids have no impetus to reveal their passions and dreams if they can’t connect those things to what they’re learning. And students will have no coherent or scholarly means of speech if they lack the support and strategies to express themselves clearly and accurately. Giving students voice isn’t only about opportunity. It’s also about inspiring and empowering them to speak with insight and poise. With practice, encouragement, and assistance, students can share ideas that are astute and profound. Words have power. Therefore, students must learn to measure their words because the right choice could change someone’s life, including perhaps their own. Being articulate is one of the most important skills a person can possess and thus one of the most important skills a teacher can foster. When students analyze historical speeches, political debates, TED talks, and tweets related to their current unit of study, or the dialogue in narrative texts, teachers can have them explain points where word choice has a particularly significant impact. If that impact is unintentionally negative, it’s a worthwhile exercise to have collaborative groups reword key phrases and passages and share their improvements with the class. Through this modeling and awareness of how to handle words, students’ writing and personal interactions become increasingly sophisticated and nuanced. We teachers can strive to measure our words when speaking with students—it will make all the difference in our relationships with them. With words well chosen, teachers can guide, congratulate students on their achievements, and encourage them when they come up short. There are several ways we can improve our communication with students and strengthen our connections with them. Listen to the way the colleagues we admire talk to their students, and adapt their words to suit our own style. We can rehearse exactly how we’ll communicate expectations to students, especially at the beginning of a school year. Over time, we can refine our responses to student behaviors—both positive and negative. Having a few choice phrases at the ready can defuse potentially dicey situations or help us capitalize on the progress we helped inspire. When tempers flare, it’s a good idea to take students aside and sincerely ask, “What do you need from me right now?” Their answers are usually reasonable requests that can be granted, even if only temporarily. This may be enough to build a reputation as a sensitive teacher. We can use positive reinforcement so students feel recognized for their contributions in class. When giving praise, we should explicitly state what the student is doing right and thank the student. Enthusiastically acknowledging students for their strategic efforts and accomplishments, rather than seeming to always catch them doing wrong, gives them some goals to aim for. We can make the time to have regular face-to-face check-ins with each student. This takes us a step further than merely marking essays or grading tests. As an English teacher, I no longer conduct writer’s conferences with my students—we now engage in conversations that feature equal input and exchange of ideas between teacher and student. Interacting with students is an art form that takes dedicated practice and yields wondrous results. 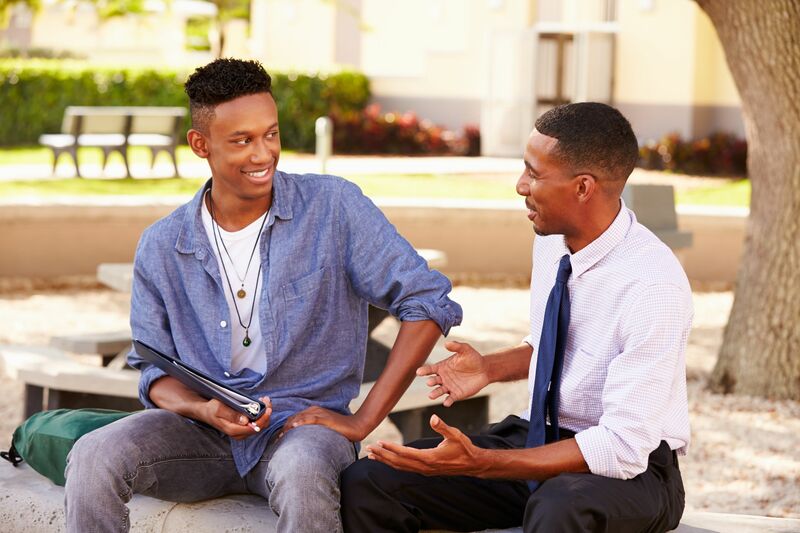 A teacher’s ease in speaking with kids largely determines if they form a bond with their students—and if, in return, those students express themselves freely and with increasing precision and skill.